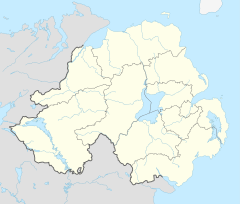 Markethill is a village in County Armagh, Northern Ireland. It sits at the southern side of Gosford Forest Park. It had a population of 1,652 people in the 2011 Census. A livestock market is held here three times a week and each summer the world's largest Lambeg drumming contest takes place in the village. It is home to Kilcluney Volunteers Flute Band, who host the largest band parade in Europe on the first Friday of each June. This attracts thousands of onlookers and participants. The village sprang up within the townland of Coolmallish or Coolmillish (Irish: Cúil Mheallghuis), on the road between Armagh and Newry. It began to grow during the Plantation of Ulster as a town for Scottish and English migrants. The village of Markethill was founded by a Scottish family, the Achesons of Gosford (or Goseford), Haddingtonshire (East Lothian), who received a grant of 1,000 acres (4 km²) from King James VI & I in 1610. The Achesons built a strong castle at Cloncarney around 1617, but it was destroyed in the Irish Rebellion of 1641. It was replaced with a manor house, visited by Jonathan Swift in the late 1720s. Swift devised the existing nature walks throughout the grounds, where he composed poems. The manor house, although occupied to 1840, has practically disappeared. In 1819, The 2nd Earl of Gosford (whose peerage had been bestowed on the family in 1776), the then head of the Acheson family, commissioned the construction of Gosford Castle. For more information see The Troubles in Markethill, which includes a list of incidents in Markethill during the Troubles resulting in two or more fatalities. Nearby Gosford Castle is within Gosford Forest Park. Construction of Gosford castle began in 1819 and finished in the 1850s. It was commissioned by Archibald Acheson, 2nd Earl of Gosford and the architect was Thomas Hopper, one of the leading London architects of the first half of the 19th century. The Ministry of Agriculture bought the estate in 1958, establishing Gosford Forest Park. Gosford Castle is the largest Grade A listed building in Northern Ireland, in 2006 after public consultation the Boyd Partnership was selected to restore the castle and covert it into 24 self-contained luxury apartments. The first residents moved in December 2008, restoration is still in progress as of May 2010. Markethill Couthouse, situated at the top of Main Street, at the north entrance to Markethill adjacent to Gosford Forest Park. Markethill Courhouse was built in 1842 to the designs of Thomas Duff, it is one of the few surviving large regional free standing Courthouses built in the middle century. The building is constructed of random Blackstone with Armagh limestone quoins and dressings. The building was last used as a courthouse in 1952, was purchased by Markethill District Enterprises Ltd in June 1997, after lying vacant for 25 years. The building was restored to its former glory for use as a community centre. Markethill Swifts F.C. play in the Mid-Ulster Football League. Markethill railway station opened on 25 August 1864, closed for passenger traffic on 1 February 1933 and finally closed altogether on 2 May 1955. Located on the Armagh to Goraghwood section of line run by the Great Northern Railway of Ireland. Markethill railway station in 1970 on the line constructed by the Newry and Armagh Railway. In the 2011 Census Markethill had a population of 1,652 people (688 households). The first significant industrial capacity in the town was established in 1888 by DH Sinton who established a linen mill, close to the towns railway station. The mill was purchased by Spence, Bryson & Co. Ltd in 1909 and remained operational until 1991 when it was badly damaged by an IRA bomb. Production at this point moved to a sister factory in nearby Portadown. Today the area is largely focused on agriculture and is centred on the large agricultural mart situated on the Cladymilltown Road on the outskirts of the town. Markethill Livestock Sales has been established for more than 45 years. The previous Mart premises is currently lying empty as a derelict eyesore in the town. A small business park has been constructed on a section of the former Spence, Bryson & Co. Ltd Linen Mill which contains a number of small business' and start-up enterprises. The business park is administered by Markethill Business Centre on Fairgreen Road. There are several large established independent business' located in the town. These include Alexander's of Markethill and Alexanders Furnishings, established in 1946 and operating from the old Market House among other buildings. They retail a large range of furnishings, carpet, beds, fancy goods and a restaurant. Dalzell's of Markethill, established in 1956 and operating from the former Northern Bank building among others premises retail, wholesale and export electrical appliances across Ireland. They also retail a large range of furniture, beds, carpets and fancy goods. ^ a b "Markethill". Census 2011 Results. NI Statistics and Research Agency. Archived from the original on 22 April 2015. Retrieved 22 April 2015. ^ "Markethill station" (PDF). Railscot - Irish Railways. Retrieved 2007-11-03. This page was last edited on 10 January 2019, at 05:38 (UTC).